Property investors looking to make a good return should consider buying in Dundee, a new survey has suggested. Dundee has seen a bumper property boost. 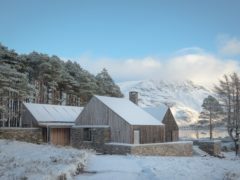 An off-grid “modest, sustainable home” in the Scottish Highlands has been crowned House Of The Year. House prices in Dundee increased by 1.5% in May, contributing to a 5.4% rise over the last 12 months. Dundee has been named the most affordable city in Scotland for first-time buyers looking to step onto the property ladder. Private tenants in Dundee are paying about £540 more in rent each year than they were in 2013, a new report has found. A furious property developer has lashed out at council chiefs after they rejected his plans to save a historic block of flats. Dundee remains the cheapest of Scotland’s four major cities in which to rent privately. Tayside’s property market has enjoyed a bumper year, with strong demand pushing up sales by around 10%. A luxurious townhouse in Dundee's West End has come on the market for £450,000. Some parts of Dundee are almost four times more expensive to buy property in than others, a Tele investigation has shown. Tenants in Dundee are having to pay significantly more every month than homeowners in the city, according to a study.